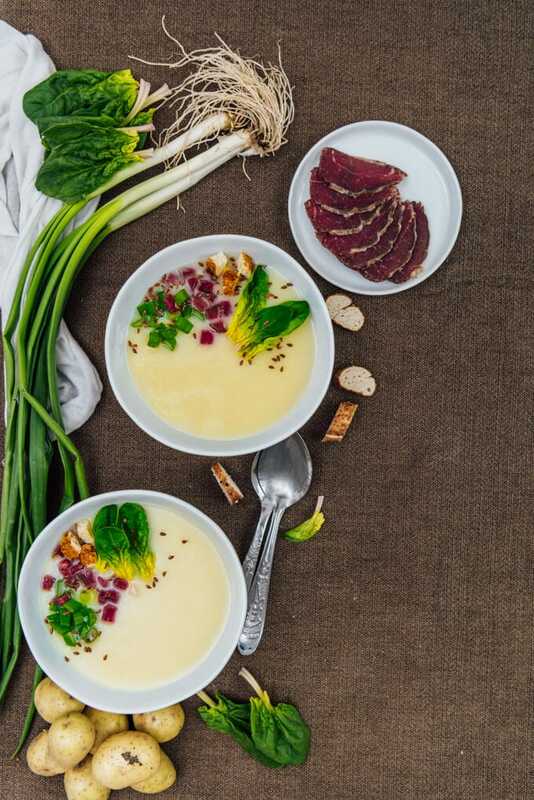 This easy Cream of Potato Soup warms your heart perfectly on chilly days. Simple yet flavourful and comforting. Super creamy without cream, so it’s lighter and healthier. This recipe was originally published in 2009 and we’re updating it today with new pictures. Is it cold in your area too? Although I feel more like a summer person, there are reasons why I love winter too. For one thing, I have comforting soups like this Cream of Potato Soup often, even for lunch or dinner on its own. Believe it or not, soups make one of my favorite breakfast foods as well when it is cold in the early morning. Another reason is I bake more during winter months, which you already know. Obviously I cook a lot of soup. The colder the weather, the warmer our kitchen thanks to the soup simmering on the stove. Mostly a simple Turkish Lentil Soup because it requires no effort at all. Tomato Rice Chicken Soup when we plan to have it as dinner on its own. We do have a flavorsome smooth soup as well, like this Cream of Potato Soup or Cream of Broccoli Soup. I love them all. What makes a soup comforting and tasty? Besides the ingredients we use to make a soup, I think the topping is equally important. Isn’t it great that you can make your own creations on your soup. Chopped green onions, fresh spinach leaves, simit croutons and aged-beef are on my cream of potato soup today. What to use to garnish your soup is totally up to you, but I must tell you that mine makes a perfect combination of flavors in the soup. Turkish people are so creative in naming people, things or situations. Sometimes they use the names of vegetables to make someone angry. The word potato is one of them. I know it’s rude, but mostly children use it when they are addressing an overweight person they don’t like. Just like the phrase couch potato. Anyway, although the word ‘potato’ has a negative connotation when used for people, it is one of the vegetables that we use the most. You can see it in several Turkish recipes either as the main ingredient or as an additional ingredient. Let’s see how we use it to cook a delicious and easy cream of potato soup. You must try this recipe if you are craving for a heart warming potato soup these days! We love it with a little chopped fresh dill or another herb and ground black pepper. Make sure you squeeze lemon in your bowl if you love your soup tangy. Updated: It is January 10, 2012 today and everywhere is covered with snow! We made this potato soup today with an addition of stock, so we added 3 cups water and 2 cups chicken stock. It was absolutely tasty and warming! 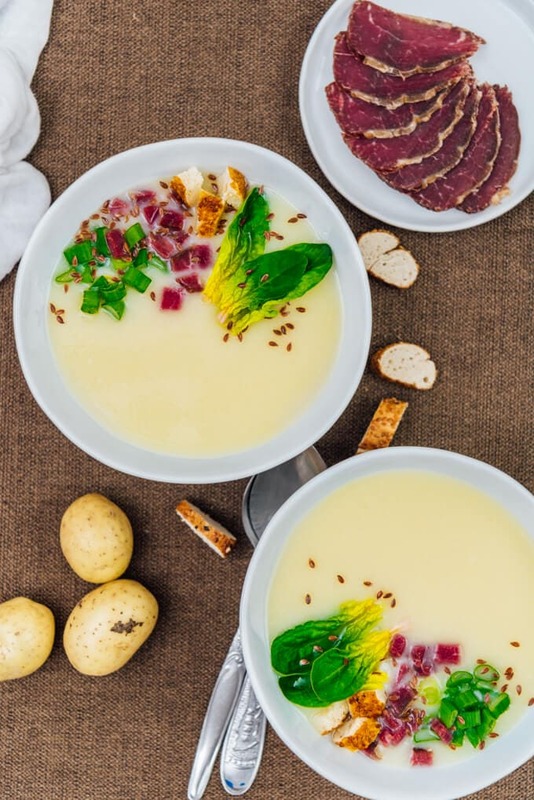 Try it with stock to have a more flavourful and warming potato soup! A very heart-warming and flavourful potato soup. Put chopped potatoes and onion, water or chicken stock in a deep pot. Season with salt and pepper. Bring it to boil. Simmer over medium low heat until potatoes are very soft. Meanwhile, in a medium saucepan melt butter over medium heat, add flour and cook for 1 minute while whisking constantly. While whisking, slowly add milk and cook, stirring constantly until mixture begins lightly bubble and thickens. Pour this into the pot and blend it using a blender or in a food processor. Serve it with your favorite soup topping. Yes, a wonderful bowl of soup! 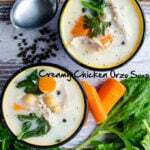 Nice simple recipe Zerrin. I will try this. And I love that not round bowl. When I first saw the top picture I thought maybe I needed my eyes examined! Oh yes, I love that bowl, too. It is a bit confusing at first sight, isn’t it? I love your website and recipes. I can’t wait to try this soup recipe. I have a nice pumpkin soup recipe if you are interested. Check it out on my blog.